Two weeks before Thanksgiving, it appears as though a female turkey nicknamed Tammy is trying to get the heck out of town. An office worker driving to work on the New Jersey Turnpike called the authority trying to get it removed. "I'd hate to see it hit by a car, and it could cause an accident," Donna Debrango told NBC New York. It was "strutting back and forth across a ramp" at Exit 14B in Jersey City, according to spokesman Joe Orlando. He declined to speculate if she might be trying to hitchhike a getaway before she faced the chopping block, though hitchhiking on the Turnpike is strictly illegal. However, Orlando did note, "She hasn't gone through the toll plaza yet so she's technically not in violation (of Turnpike rules)." Then again, seeing no evidence of an E-ZPass tag hanging around her neck, "I'm guessing she's not an E-ZPass customer," Orlando speculated. Either way, based on her movements so far, it seems as though this bird could not maintain the minimum speed limit required on the Turnpike. In fact, motorist Debrango said she's seen it hanging around the exit all summer, adding she wants it captured and saved. "I know at Popcorn Park zoo (in South Jersey), they take in animals all the time," she said. 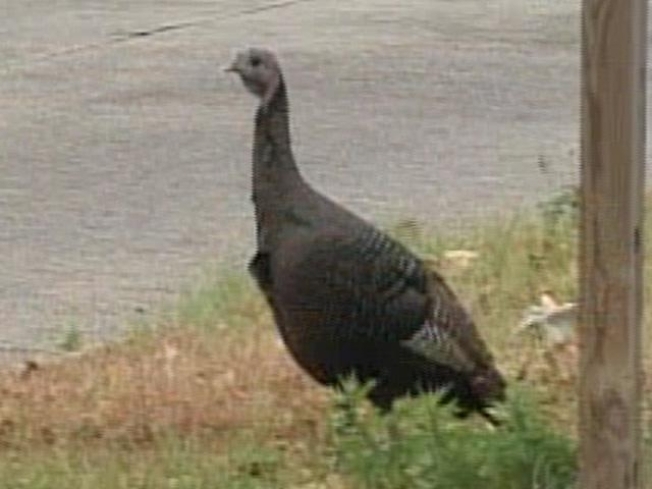 "A couple of minutes ago I got to watch a turkey play chicken with a tractor trailer," deadpanned Orlando. Asked if he felt more sorry for the turkey or the tractor trailer, Orlando added, "It could go either way, just depends whether you're an animal rights person or not."